What if Deviation from Poll Numbers in Atlantic Canada Holds throughout the Country? The Liberals are way outperforming polls in Atlantic Canada. What if they outperform polls by the same amount across English Canada? Shocking, right? And consider that the above is assuming that over/underperformance is the *minimum* of arithmetic and proportional change. Have a good election night! It's likely to be easy if you're a Liberal. Find your polling station at Elections Canada's website. Click here for a summary of the projection. Click here for the projected winner by riding. Click here for a roundup and comparison of the various projections. Click here for the complete trends since early September. I have less time than I hoped for this, so I'll be brief. All times Eastern. 7pm: Polls close in Newfoundland. The Liberals should handily win all 3 ridings off the Avalon peninsula. They should also carry Avalon, despite the best efforts of Scott Andrews. The NDP will almost certainly win St. John's East. The race to watch is St. John's South--Mount Pearl, where both the projection and a riding poll this week suggest a very tight Liberal/NDP race. 7:30pm: Polls close in the rest of Atlantic Canada. I'm projecting 26 Liberals, 3 NDP and 3 Conservatives - the latter all in NB. Egmont (Gail Shea), Central Nova (Peter MacKay's old riding) and Halifax are all projected to narrowly go Liberal. At this point, keep a very close eye on the popular vote. In 2011, the Conservatives outperformed polls by a similar margin across English Canada. Therefore, Atlantic Canada may be an early indication of how things are going. - If the Liberals get above 55-56% and the Tories get below 19-20%, we could be en route to a Liberal majority. - If the Liberals get below 52-53% and the Tories get above 22% or so, the election could turn out to be a nailbiter. I will post a brief projection update based on the Atlantic numbers at around 9:15pm EDT. - Will the Bloc regain official party status (12 seats)? All projections have the Bloc at 11 seats or less, but there is so much uncertainty that the odds of this happening are still quite decent. - How well does the NDP vote hold up in Québec? The NDP is projected at 31 seats with 26.3%. But if it drops to, say, 23%, it could be looking at a disaster, and the Liberal odds of a majority would improve significantly. - How big is the Liberal margin of victory in Ontario? The projection says 10% adjusted, 12.4% unadjusted. If that number climbs above 15%, we might have to stay up late to find out whether the Liberals win a majority. Conversely, if it drops below 8%, the Tories have a good chance of eking out a win. - Liberal breakthrough in Calgary? Liberal/NDP breakthrough in Edmonton? The Tories have actually trended up strongly in Alberta in the past 2 weeks. The Liberals kept pace, but the NDP lost almost all of the Notley momentum, and its support fell by as much (proportionally) as in Québec since August, i.e. almost half! I think the Liberals have a good shot at 4 ridings (Calgary Centre, Confederation and Skyview, and Edmonton Mill Woods), while the NDP can hope to gain Edmonton Griesbach. 10pm: Polls close in BC. I'm projecting a very efficient vote for the Tories, and a very inefficient vote for the Liberals. Will those pan out? (They are at odds with most other models.) And what's going on in Victoria? With no public poll from that riding, it is difficult to know whether the Greens are on track to win a second seat there. Enjoy election night, and once again, look for my post around 9:15pm EDT (follow me on Twitter if you need a reminder)! Below are the projections based on polling aggregates - there are links to all of these on the left. They are listed in increasing magnitude of Liberal victory (difference between Liberal and Conservative seat counts). *Do not appear to include late polls from yesterday. **Significant use of information other than polls. ***It's really 137.5-117-76.5-6-1 since there's a tie in Davenport. Pierre Martin has clarified that the Liberal percentage is slightly higher in Davenport; the Liberal number above for Le calcul électoral has been updated. Also, the Globe's election model provides similar probabilities as I gave here. The first thing to notice is that two models are projecting a Liberal majority. But both of them are quite puzzling: they only have the Liberals at 37-38%! I'm almost certain that if these models are right and a Liberal majority occurs, it would be due to offsetting mistakes: bad vote projection (too low for the Liberals) and bad model (too many seats for Liberals for a given vote projection). The CVM model is also an outlier in predicting that Elizabeth May will lose her seat, while Teddy and Politics is the only one forecasting a seat for Strength and Democracy. The Signal also looks weird: it is projecting a much bigger Liberal seat count than me on similar popular vote. My sense is that 160 seats is plausible for the Liberals, but seems quite unlikely with less than 37% popular support. - The divergence is instead showing up for the NDP. 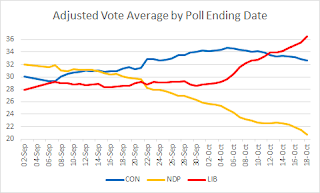 Excluding my model, the three uniform swing models have the NDP at 75-79 seats, while the two proportional swing models having incorporated the latest data have the NDP at 66-68 seats. 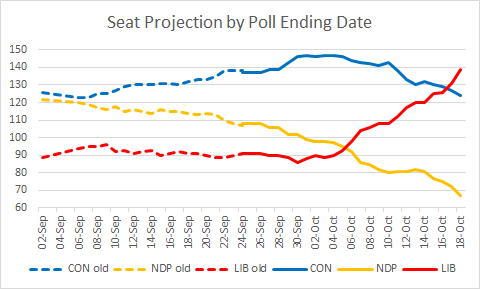 This is due to the NDP decrease in Québec: it is now only holding on to relatively good seats, and proportional swing makes the drop in those seats bigger than uniform swing. (ii) the pro-CPC turnout adjustment. - I also have a relatively high CPC popular vote, obviously due to the turnout adjustment. Too Close to Call also has a turnout adjustment, but it is smaller than mine; on the other hand, that model did not apply the change described in (i) above. These two differences appear to cancel out. The Signal also has a similar CPC vote, presumably because it missed some late polls. - I have a relatively high LPC popular vote despite the turnout adjustment because of the change described in (i) above. Note that without the turnout adjustment, my projection of 150 seats (on 38.3%) for the Liberals is higher than all non-outliers. - Finally, the Bloc seat count is incredibly hard to pin down - projections range from 1 to 11... Honestly, for the Bloc, it felt like throwing a dart with a blindfold since no pollster has come out with a regional breakdown of Québec since the NDP's plunge there. Click here for a summary of the projection. Click here for the complete trends since early September. I expect around 60 ridings to be incorrectly called, for an accuracy of 80-85%. Below 80% would be disappointing, and below 75% would be a bad night. Above 85% would be good, and above 90% is very unlikely unless the aggregate projection is nearly on the dot. Here is how other projectors and I did in 2011 - success rates hovered around 80%. Note that the 172 other ridings still have an up to 10% chance of being wrong - so there will very probably be some mistakes among them. In order to take into account the movement observed in the past few days toward the Liberals, conservative modifications were made to some polls taken earlier in the week based on the evolution of the Nanos and EKOS tracking polls. Moreover, the turnout adjustment used throughout the campaign was reduced by around one fifth outside of Québec in order to take into account movement from the CPC to the LPC among seniors. Finally, a riding-by-riding examination of the projection resulted in some seats being moved (mostly in Québec); the net effect of this was no more than 2 seats for any party. Such numbers imply a Liberal seat plurality short of a majority with probability around 75% 65-70%. A Conservative seat plurality and a Liberal majority have a 10-15% roughly 15% and 15-20% chance of occurring, respectively. Therefore, depending on whether one believes in the turnout adjustment, the probability of a Liberal win is around either 75-80% or 85-90% 75% or 85%. Thus, although the Liberals are clear favourites, there is a significant chance of a slim Conservative plurality. Similarly, a Liberal majority cannot be ruled out. As you can see, the Liberals are projected to win the popular vote in Québec, but due to the concentration of their vote, they are projected to win fewer seats than the NDP. It should be noted, however, that Québec is replete with three-way (and some four-way) races, so the seat projection in Québec is less reliable than usual. The Liberals are also projected to be in a tight contest with the Conservatives for winning the BC popular vote. However, they are favoured in only half as many seats as the Tories. Before I figure out how to deal with the issues raised in the previous post for the final projection, I present the last update of projection trends. I'm doing this before the final projection since trends are most informative when computed with a consistent methodology. For those of you that are new, the dotted lines indicate that those projections were made without taking into account riding polls and sub-regional breakdowns. 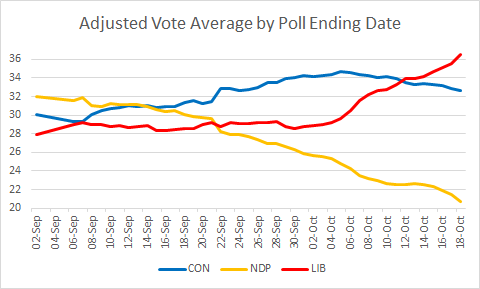 As you can see, in the past 2 weeks, the Liberals have gained seats at a fairly consistent rate of 3-4 seats per day. The Tories have been losing 1-2 seats per day, also fairly consistently. 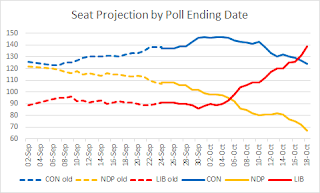 The NDP, however, has had two periods of steep drops with an interlude in between: for a while, it appeared as though the NDP stopped the bleeding at around 80 seats, but the down trend then resumed with a vengeance. The vote shares tell a similar story, though the Tories have lost only 2 points in the past 2 weeks. The Liberal surge, especially in Ontario, hurt the Conservatives more than the drop in their own support (i.e. if it were instead the NDP that had gained support, the Tories would not have lost as many seats). More remarkable is the fact that the NDP has lost over 1/3 of its support since Labour Day. Finally, I should also mention that the Greens have lost roughly 1 point in the past 2 weeks, probably as progressive voters switched in order to "make their vote count." This is why Elizabeth May pleaded for people to vote their conscience. And we have come to the last polls of the campaign. Ipsos' last poll for Global shows stable numbers nationally and in ON compared to last week. The Liberals remain in front in Québec, and have crossed the 30% threshold, like in Nanos, Léger and Mainstreet. The Liberals are also at 40% in BC, which looks like an outlier. EKOS' last poll showed some movement (well short of statistical significance, but still): the Liberal lead widened from 1.7% to 3.9%. None of the regional changes is that exciting (the Tory 15-point lead in BC shrank to a still-large 10-point lead). However, the Liberals erased the gap with the Tories among seniors. Note that Ipsos, Mainstreet and Forum (below) show the same thing. Only Angus Reid, on which my turnout adjustment is partly based, has the Tories still doing well among seniors. Forum's last poll shows a 10-point lead for the Liberals, and led Forum to project a Liberal majority! The most shocking numbers are in Québec, where Forum has the Liberals well in front at 36%, while the three other main parties are all in the 19-22% range. Nanos' last poll has a bigger sample, so Nanos provided the national numbers for each day. The Liberal national lead was 8.6-8.7% on both Saturday and Sunday. There were no big regional variations from the last Nanos poll. Finally, Insights West provided polls of Alberta and BC that are consistent with the polling average. - I will go through the country riding-by-riding. - I will chew on the excellent Liberal numbers from today and the fact that the senior gap has been erased. I will probably end up putting even more weight on recent numbers and reducing the turnout adjustment. These numbers imply a roughly 65-70% chance of a Liberal win, including a 3-5% chance of a Liberal majority. These unadjusted numbers imply a roughly 85% percent chance of a Liberal win, including a 10% chance of a Liberal majority. Unfortunately, I do not expect to have time to provide a guide to strategic voting. Update: Throughout the day, I will update the projection on the left as new polls come out, and I will tweet the updates. However, I will not write another post until this evening. - In Québec, the Tories drop all the way from second to fourth, swapping ranks with the Bloc; the NDP, Liberals and Bloc are all within a 2-point range. 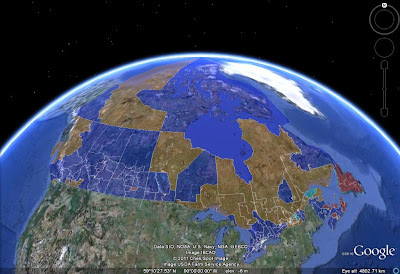 In the projection, fully 16 Québec ridings are being won with less than 30% of the vote! - In Ontario, the Liberal lead widens from 8.3% to 12%. - In BC, the Tories jump to a 16-point lead over the NDP and the Liberals. None of these variations are statistically significant - EKOS urges special caution on the BC numbers. Today's Nanos poll is essentially the same as yesterday's. There has been small drops in the Liberal leads in QC and ON, but nothing of note as the Liberal number changed by less than 1% in both cases. The NDP lost 3.2 points in BC and is well back of the Liberals and the Conservatives, similar to what Mainstreet showed yesterday. There will also be an Ipsos poll (and possibly a Forum poll) to be added when available. Obviously, with the current projection so tight, tomorrow's numbers will determine the call. But in a sense, it doesn't matter: barring a huge surprise, it's going to be around 50/50 one way or the other. Moreover, even if the Conservatives eke out a small win, the next government is still likely to be Liberal. Nevertheless, with the race so tight and with Québec so unpredictable, the next 55 hours are going to be extremely exciting!